Layer bread slices in shallow baking dish and pour over egg mixture; let stand until bread begins to absorb liquid, for about 2 to 3 minutes. Turn bread slices and let bread absorb liquid on opposite side for 2 to 3 minutes more. Add 3 to 4 slices of soaked bread to grill top and cook until golden brown and crisp. Turn bread and cook until golden brown and crisp on opposite side, adding butter as necessary to help browning and to give French toast nutty flavour. 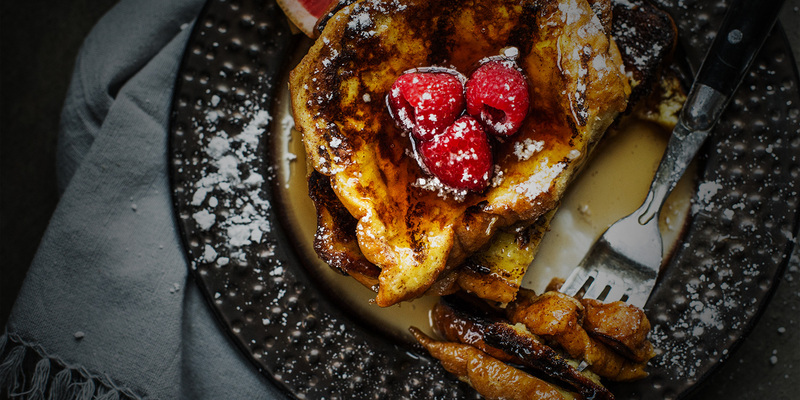 Serve French toast immediately after dusting with icing sugar, top with syrup, and fresh fruit or bacon, if desired.